When Hermione – eccentric, seventy and returned from India to a ‘safe’ life in the Home Counties – encounters Slug street-painting on the pavement, she employs him as assistant gardener. Slug, who has the motto ‘Never Grow Old’ tattooed across his head, will soon sort out Gerald, the pin-striped head gardener, soften his ruthless marshalling of her plants and introduce a more effusive atmosphere to her estate. But when Hugh, Hermione’s huge husband, dies, Slug’s skinhead cronies begin to threaten her peace, and Hermione retreats to the chaos of India, chasing the memories of her previous life. What happened to the young Indian with whom she fell passionately in love when she was nineteen, and who had insisted that she marry the more ‘suitable’ Hugh? Can she recreate the dream of over fifty years ago? 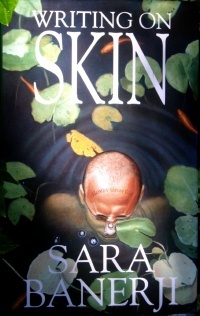 Writing on Skin is blackly comic in its humour and sweeping in its imaginative scope.